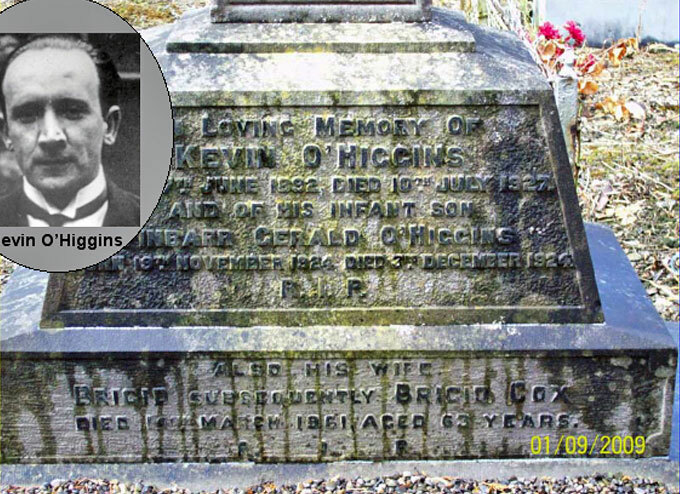 Kevin Christopher O’Higgins ( 7 June 1892 – 10 July 1927) was an Irish politician who served as Vice-President of the Executive Council and Minister for Justice. He was part of early nationalist Sinn Féin, before going on to become a prominent member of Cumann na nGaedhael. O’Higgins initiated the An Garda Síochána police force. Kevin O’Higgins was born in Stradbally, County Laois and was educated at the Jesuit-run Clongowes Wood, at Knockbeg College, St.Marys Christian Brother School [portlaoise] at St. Patrick’s Seminary at Maynooth, and at University College Dublin. His aunt had married the Nationalist MP Tim Healy. He joined Sinn Féin and was imprisoned in 1918. While he was imprisoned he became MP for Queen’s County (Laois). On Sunday, 10 July 1927, O’Higgins was assassinated at the age of 35 on the Booterstown Avenue side of Cross Avenue while on his way to Mass at the Church of the Assumption by three anti-Treaty members of the IRA, Timothy Coughlin, Bill Gannon and Archie Doyle, in revenge for his part in the executions of IRA men during the civil war. He was afforded a state funeral and was buried in Glasnevin Cemetery. His brother Thomas F. O’Higgins and nephews Tom O’Higgins and Michael O’Higgins were later elected TDs.